Linda Nemec Foster reiterates this real and imagined theme of yearning and self-discovery throughout the four sections of Amber Necklace from Gdańsk. …may we never recognize each other on street. Can one re-unite the two? No, never, and if we could then would we be better off not knowing what life would have been like anyway. A bit paradoxical? Absolutely! The “longing” to be someone we could never be, yet at the same time thinking we should have at least had a “chance” at it. A choice, perhaps This is the unknown, the not knowing (that can never truly be satisfied); and that which a second generation girl/woman ponders, especially when one is blessed/cursed with a creativity poetic mind. A mind that questions. This is a book of interconnected narrative poems with an undertow of longing for a life we can never have. Therefore, the second poem, “Doppelgänger,” has set the stage for the remainder of the poems in this collection. The fact is she was born here, but her love is reflected in poems about a family she knew and a family she will never really know. This wise archetypal dream woman trying to offer closure tells the immigrant “you’re home” to give the disconnected speaker peace, resolution. Yet, there really is no peace, no closure for three generations of women, who must live without a sense of true peace; and it’s not just the woman speaker, who is displayed but it is her grandparents, parents, and her own son that carries the burden of loss. He is anonymous as a fairy tale. księżyc, księżyc, latać, latać, daleko. and please, take me with you. Here, the child’s plea, “please take me with you” to my real home, because the moon can see all, Poland and America, and the child is homesick for something he cannot have. nie wiem. I am sorry, I know nothing. A real page turner, so captivating that you, the reader, become engrossed with each poem, as I have; but you must continue onward with a reverent, dirge-like pace through the remaining three sections, as they will hypnotize you as well. She is allowing their voices and her voice to be heard, so you can learn of the honesty, integrity, and beauty of each lived life. These narrative-memoir poems tell the familial immigrant stories of her grandparents and parents and also Nemec Foster’s very own second-generation story of, mentally and physically, crossing the Atlantic from America to Poland and then back to America again. Since I have elaborated in Section I, I will try to consolidate the remaining three sections, and this is not to diminish those sections, no, not at all, but in order not to make this – a too long review. Section II – The Rivers of Past and Present; Section III- Dark Amber of Regret; & Section IV – To Smile at the Closed Mouth of Loss will keep the reader totally engaged. I will pick one poem from each section to focus upon, as briefly as I can, in order to do justice to both poet and poem. Section II– The Rivers of Past and Present has four prose poems, with the exception of the poem, “The Two Rivers in My Story.” Once again these poems do not spare the reader their emotional empowerment, with an intense flow of prosaic images, narratives, and truths felt by a transplanted poet. America’s Cuyahoga River aligns, yet conversely misaligns with Poland’s Vistula River – just as the past aligns, yet conversely misaligns to the present, at least in Nemec Foster’s telling of rivers and time in her prosaic poem, “The Women with the Two Rivers Growing from Her Hair” (wonderful title). Here, Nemec Foster recounts a “true” story told to her by her mother about her grandmother, Maria. …I know it’s true because my mother told me that her mother saw it with her own two eyes. Interestingly enough, oral history imagined or true is prevalent among immigrant families and serves as a connective thread often linking one generation to the next, especially in this story of women. Maria, my mother’s mother with green eyes who died long ago, whom I never knew, but could only imagine. Without giving the total story away here are some lines of her grandmother’s story told by Nemec Foster’s mother to her, whereby the flow of the women of her family and the flow of rivers align and misalign with each other. One day she decided to leave her mother, her father, all her sisters and brothers, aunts, uncles, cousins, and friends and come to the New World and live in America. Her grandmother settled in Ohio in a boarding house near the Cuyahoga River and it took her weeks to pronounce the river’s name. She especially loved the sound of the city’s river, Cuyahoga, even though it took her many weeks before she could even begin to pronounce it. …As if trying to will the river into her tiny bedroom on the third floor of Mrs. Okasinski’s boarding house. The grandmother’s dream of the Vistula River in Poland, where she turns into a mermaid. A straight up metaphor, why, because oral tradition and the imagination usually go hand-in-hand. She was a mermaid swimming in the deep, clear waters of her homeland, the Vistula River. Her legs had turned into one huge fin, her beautiful hair had become filmy seaweed. Even her green eyes had turned into the blue-white of mother-of-pearl. – “like” for comparative purposes. The Vistula flowed around her like scattered diamonds. For the first time since leaving Poland, she felt homesick. In the morning when she awoke, the rain was still falling, like drops of a river from the sky. Her long, golden hair had explicably transformed into the two rivers she loved so much: blue Vistula of the fish-maid; green Cuyahoga of the exotic song. They flowed from her head like twin cascades of the past and present, the old and the new. Some say the woman disappeared into the rivers that claimed her. Some say she walked into the rain and became the rain. And some refuse to believe that a woman’s hair can change into the waters of two rivers by mere act of a strange dream. But then, they don’t know the woman. Here the speaker, I, uses the image of her “hair” to connect her. wanting to be a braided rope that connects the two. The hair image of the “I” speaker resonates back to the grandmother, Maria, and her “long, golden” braided hair (Section II, above). The speaker (probably Nemec Foster, herself) using a very womanly image of her hair is trying to connect the disconnect. Actually the braiding of three long individual strands (daughter, mother, grandmother) into one braid connects the three women together in their two distinct worlds. can prepare you for this. Nothing can ever really prepare you for “this” meaning death. strands of the past braided around my neck. White amber of memory, gold amber of song, dark amber of regret. So, three colors of amber as memory, song, and regret are braided appropriately, as title of this book of poems. Linda Nemec Foster and her sister have truly learned to smile despite loss and the reader gallops along with Linda and her sister “to the Beer Barrel Polka” with “RESPECT” for the glowing women they have become in America. In the second-generation immigrants’ fight for recognition, Linda Nemec Foster has won the braided Amber Necklace from Gdańsk glowing with three “tears (tiers) of the sun” around her neck. Linda Nemec Foster is an American poet of Polish ancestry, who has published nine collections of poetry and lives in Michigan. Ten Songs From Bulgaria (2008) is her eighth collection, a chapbook with poems inspired by Bulgarian artist Jacko Vassilev’s black and white photography from the (post-)communist epoch(s) and which inspired Hungarian folk musician Laszlo Slomovits to compose a CD, Cry of Freedom. Each of the ten ekphrastic poems included in the collection has ten lines and each line has about ten syllables. In them, the poet makes use of the power of the enjambment, moderate repetition and sometimes counterpoint, with the purpose of presenting a reality from elsewhere and the play between past and present, imagination and reality. Several names (Vladimir, Cristo, Stoian and Zlatio Zlatev), the symbol of the dancing bear, the reference to the Balkans and Eastern Europe highlight a geo-cultural framework specific to Bulgaria. As well as Jacko Vassilev’s dramatic photos, Linda Nemec Foster’s poems depict people “banished from the Garden of Eden”, who find other types of Eden in surreal artistic faith and unusual music and dance. In line with Vassilev’s photos, which illustrate the life of the poor during communism and immediately after, the poems too echo aspects related to the lives of the unfortunate. Inspired by the photographer’s compassion, the poet weaves multivalent stories around moving static pictures and, in contrast with the pictorial project, she sometimes makes the personages speak their own minds. The characters of these poems vary from “he” or “she” to “they”, which conveys a sense of detachment and contemplation, or they are written in the first person singular and sometimes the “I” is combined with “they”, “you” or “she”, which transmits empathy and involvement with a “world as tangible as fog”. and manic jitterbug. Now look at me. to dance, cannot remember the basic steps. Music of the forest stuck in my throat. The poem starts as a fairytale – and there are many of them with and about bears in the world – but ends as a story closer to contemporary man’s attitude to otherness, be it human, animal, natural, cultural etc. The point of dramatic change placed in the middle, “Now look at me”, signifies a boundary between myth and reality, a door between expectations and fact, between a certain cultural label and truth. It questions the artist’s gaze in a world in which we all watch and are watched and in which those portrayed can more easily talk back. The initial contrast – “I did not exist” / “Only danced” – alludes to the Western imagination of the Orient and is reinterpreted in the second part of the poem as absence, whose phenomenology is subtly instrumented with the verb “to refuse”, the negation “cannot remember” and the adjective “stuck”. “I refuse / to dance” may stand for a response against stereotypes. Dance does not mean only waltz, fox-trot, tango or jitterbug, all of them related to the urban European and American cultures. The title of the poem reminds us of rural areas and crossroads. Moreover, dancing as a form of body art is indirectly contrasted with the art of writing as opposed to singing or speaking. The poem is interesting from a gender perspective too. Hunting in general and hunting bears in particular have traditionally been associated with men and their relationship to nature. What Linda Nemec Foster proposes here is a feminine or queer perspective on the same relationship, given that a persona poem implies a mask. Although there is no word in the text which might suggest the bear is anything other than masculine, the fact that the poem was written by a woman casts an intriguing light. What if the dancing bear is a she-bear? Does it make any difference? Of course it does. If chaining and muzzling a she-bear means there will be no more baby bears, then the poem offers a distinct feminine or queer view on understanding and performing wilderness. The empathetic personification suits the object and subject play, in the sense that it projects a dialogic attitude to otherness. Moreover, the underlying meaning of the word “bear” as a verb and its idiomatic expressions suggest a whole complex universe in itself. The poem also speaks about America and its wilderness, by alluding to the mythical bear portrayed by William Faulkner. It represents a return to nature, as both environmental and human, and a possible internalization of the old Ben (from The Bear, a short story included in the collection Go Down Moses) as a cultural symbol of freedom and untamed nature, here transposed in an Eastern European geographical location. Giving voice to a bear also hints at the contemporary futility of giving voice to others, when, in fact, they came equipped with a voice, but the inability of others to hear them often translates as deliberate silencing. In the bear’s refusal to dance or to sing, the poet represents a reality waiting to be discovered. Monica Manolachi is a lecturer at the University of Bucharest, where she teaches English in the Department of Modern Languages and where she completed her doctoral thesis, Performative Identities in Contemporary Caribbean British Poetry, in 2011. Her research interests are American, British and Caribbean literature and culture, postcolonial studies and contemporary Romanian and Eastern European literature in translation. As a poet, she has published two collections in Romanian and was awarded a prize for poetic eloquence by the American Cultural Center in April 2005. She is also a translator and editor, contributing to the multilingual literary magazine Contemporary Literary Horizon. Originally Published by Galatea Resurrection 25, click here to view article. 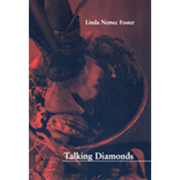 A Review of Talking Diamonds, Linda Nemec Foster’s new collection of poems. The typical poem in this beautiful collection by Linda Nemec Foster, her eighth book, is quiet, elegant, and wise. These poems do not shout; they whisper – about aging and dying, a mother’s frightful dementia (the mother no longer recognizes her daughter and calls her “Mom”), deformed children who are nevertheless a gift, and dead stars whose light still travels to us. They are filled with small, uncanny observations, for instance the demented mother saying “What a glorious burden” to the living room wall. It is the poet’s gift of compassion that makes such poems not only bearable, but a pleasure to read. For instance, we learn that the mother’s own mother died when her daughter was only fifteen. the same voice from that dark place. Linda Nemec Foster’s other great gift is her sensitivity to the astonishing in unlikely settings. Our Lady of Guadalupe on Waikiki. on the chest of a huge Mexican from Baja. as if she were a living, breathing icon. washed ashore for your approval. you stood up, took her hand, and began to waltz.
. . . After the waltz, you kissed her hand. to give you the gift of its wildness. The book is available from Amazon and New Issues Press. To see more about Linda Nemec Foster, I encourage readers to checkout her website. Poet Oriana Ivy blogs about poetry at Oriana-Poetry. Her translations of Zbigniew Herbert are available at Scream Online. Some of her poems are also available. online. A powerful sequence about her Polish grandmother appears here. Her poem “My America” about discovering America for herself is available at her blog. Originally Published by Writing the Polish Diaspora, click here to view article. “Talking Diamonds” proves to be a fitting title for Linda Nemec Foster’s latest collection of poetry as the poems within sparkle with brilliance. Honored as a finalist in ForeWord Magazine’s 2010 Book of the Year Award in Poetry, “Talking Diamonds” is arguably Foster’s strongest collection yet — quite a feat for Grand Rapids’ former poet laureate, who adds this, her ninth collection of poems, to her lengthy list of literary accomplishments. Although Foster rightly describes the collection as dark, the warmth of her works brings light to the darkness. The poetry here is emotional and moving, the way Lake Michigan moves, slowly and gracefully, a blend of cool swirls bearing shimmers of sunlight. Among her best here is “Red Amaryllis, 1937,” named for the title of a painting by Georgia O’Keefe and representative of Foster’s gift for ekphrastic writing. Written for a friend who died 15 years ago, the poem details a real-life experience in which her friend accepted an exotic dancer’s request to dance for him by taking her hand and leading her in a waltz. In the final words of the poem, it is revealed that not just diamonds underground become greater than they are, but so do we in the human realm, who similarly wait to awaken. Filtering through the collection are glimmers of Foster, herself. Although “Talking Diamonds” is filled with poems for people in her life and works of art that served as inspirations for her poems, we still see the artist standing beside the finished work. “I Enter my Mother’s Dementia” explores her relationship with her mother, through mention of the present and a reflection back to 1974. “The Third Secret of Fatima” reveals her Catholic background (Foster is an Aquinas College alumna). Another glimpse of the artist here is reminiscent of her book, “Amber Necklace from Gdansk.” We see pieces of amber scattered throughout this newest collection, a reminder of Foster’s rich, Polish heritage. Even longtime devotees of Foster’s will close the cover of “Talking Diamonds” impressed by how sharply the local poet has honed her craft. Her works here are exceptional and gleaming, serving as a reminder that even experts can excel beyond their own greatness. “I chose every word. Every word is meant to be there,” Foster said. Originally Published by The Grand Rapids Press, click here to view article. Featuring a sprouting amaryllis bulb, a handful of seashells, and a holy card of the Virgin and Child—all bathed in red—the cover of Talking Diamonds sets the tone for the many somber poems in this, Foster’s ninth collection. 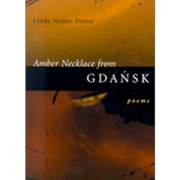 Other books by Foster, who was named the first poet laureate of Grand Rapids in 2003, include Amber Necklace from Gdansk and Ten Songs from Bulgaria. The emotional intensity of the first 20 pages of Talking Diamonds propels the reader relentlessly forward, through poems of parental loss (“Sleeping in a Room Filled with the Past” and “I Enter My Mother’s Dementia”) and parental anxiety, then downward with the falling rain and disintegrating towers to the “Total Eclipse.” I admit to finding myself in circumstances eerily similar to those portrayed in some of these poems, but that is not the only reason they haunt me like the bassoon solo in Stravinsky’s Rite of Spring. Foster crafts her poems well, juxtaposing images to great effect in “Sleeping in a Room” in which a collection of shells meshes with the physical and mental souvenirs that represent “the past lives you’ve survived and left behind.” She does the same with voices in “I Enter My Mother’s Dementia.” By alternating between the protagonist’s thoughts and artifacts of the mother’s past life and painful evidences of a diminished present, she draws the reader into the midst of this experience. Each poem grows steadily heavier as it progresses, ending in a manner very true to life. come on, come on, dive in. And yet. And yet, the emotional truth rings out in this as in other poems in the collection. Where else should the miraculous happen but in everyday lives, in moments when humans are graced with the extraordinary through enhanced perception. Foster seems to invite readers “come on, come on, dive in,” into Talking Diamonds and into life. Originally Published by 360 Main Street, click here to view article. Originally Published by Verse Daily, click here to view article. Well written poem/prose piece about a mother’s love toward her unborn daughter, and about the kind of empowerment she hopes to provide her as she grows up. Originally Published by NYU School of Medicine, click here to view article.